The Osprey scored first in the bottom of the 1 st on Osprey 3B Eddie Hernandez' RBI groundout. In the 3 rd , Osprey 2B Blaze Alexander doubled home CF Alek Thomas to make it 2-0. In the 4th , DH David Sanchez singled home 1B Cesar Garcia for a 3-0 lead. Then in the 6th , RF Jorge Barrosa's RBI sac fly put Missoula up 4-0. On the mound, Martinez held Helena scoreless on only 6 hits while striking out two. Relievers Pedro Zorilla, Melvin Ovalles, Jake Polancic, and Bryan Menendez completed the win by holding the Brewers to just two runs in the 7 th . Great Falls, the 1 st half division champ, will face Billings, the 2nd half division champ, in the Northern Division playoffs beginning Friday. In the South, Ogden and Grand Junction will face off in round one. 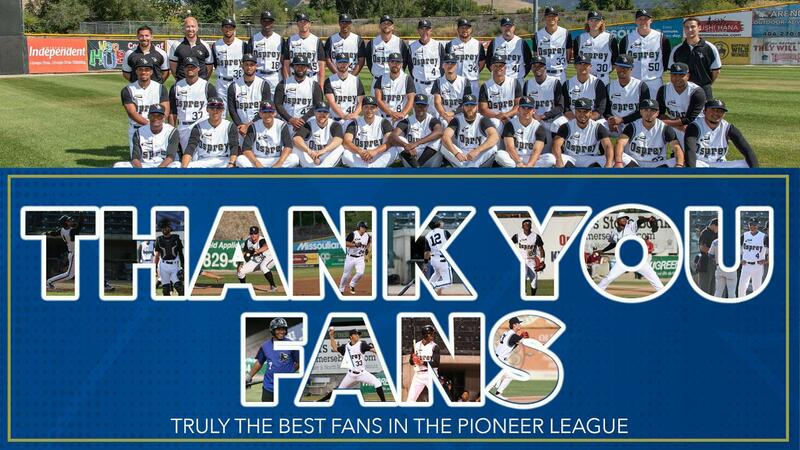 The winner in each series will meet for the Pioneer League Championship beginning on Tuesday.